Quantum entanglement—the process though which particle’s states become inextricably linked, despite being nowhere near each other—is usually carried out at incredibly low temperatures. But not any more: now physicists can perform the act at room temperature, which could have a profound effect on quantum computing and security. A team from the University of Chicago have demonstrated that it’s possible to entangle electrons at room temperature in a silicon carbide wafer. To do that, the team used infrared laser light to align the magnetic states of thousands of electrons in a 40 micrometer-cubed volume of the semiconductor, then applied magnetic pulses to entangle them. And... it worked. In Science Advances, the team reports that it was able to achieve the feat at normal room conditions, as opposed to down at the depths of temperature of -270 degrees usually required. It could prove to be a very big advance. David Awschalom, who led the research, explained in a press release that “the ability to produce robust entangled states in an electronic-grade semiconductor at ambient conditions has important implications on future quantum devices.” And he’s right: quantum entanglement can in theory be used to create unbeatable encryption, as well as being put to use in quantum computing. Being able to perform it at room temperature means that complex and expensive cooling systems needn’t be required. 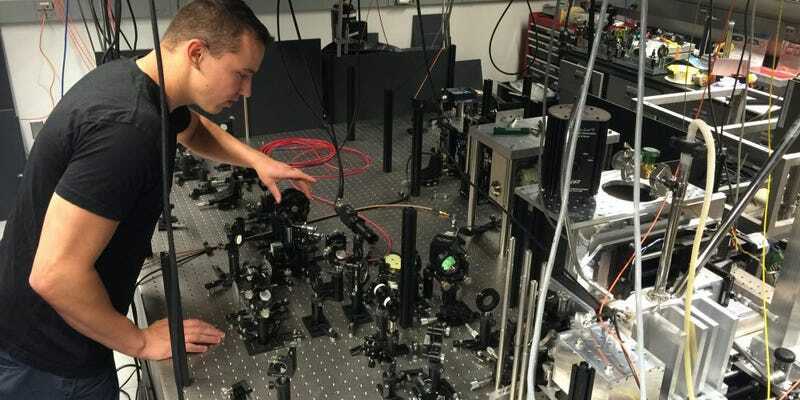 For now, though, it’s more likely that the effect will be put to use in slightly less advanced quantum sensors, for use in biomedical imaging applications. In the longer term, things could be a little more exciting.